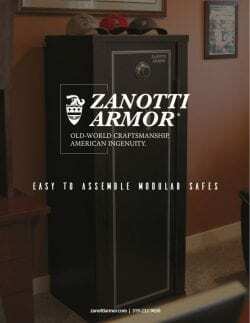 At Zanotti Armor, we build gun safes that are easy to assemble and disassemble and that offer sturdy, multi-layer security components so you can place your safe almost anywhere with confidence that it will keep your valued possessions protected. Because we’re focused on quality products that are easy to use, we’ve created a series of videos that address common topics so you can get the most out of your Zanotti Armor safe! Click on a video below for video tutorials on safe assembly and disassembly, operating your dial key and combination, and more. Many gun safe manufacturers often use terms like “quality”, “durable”, and “secure” without showing you what that really means. But Zanotti Armor invites you to explore our official brochure to see for yourself how our superior materials, old-world craftsmanship, and intelligent design make Zanotti Armor gun safes the smart choice for consumers looking for a superior safe! With full-color photos, dimensions, and other safe specifications, it’s easy to see why Zanotti sets the industry standards for sturdy structures, versatile designs, and, most importantly, client satisfaction. For quality you can see, click on our brochure below.